My friend Jeanie of All of My Art is hosting a Door Tag Challenge and you can find all the deets over there. Jeanie surely has whipped up a great idea by taking a door tag template she found on the internet and altered it. So after seeing several of her creations I said hey why not try it. Well if you know me, I can't just do something simple, I have to really fiddle and fart around and add and remove and think and ponder, drag out my embellies and so forth. Well I got the Cuttlebug out after I cut my tag out and I ran some paper through it that you can sand then it removes the top layer and reveal the white core paper underneath, thanks Mum for the paper!!! 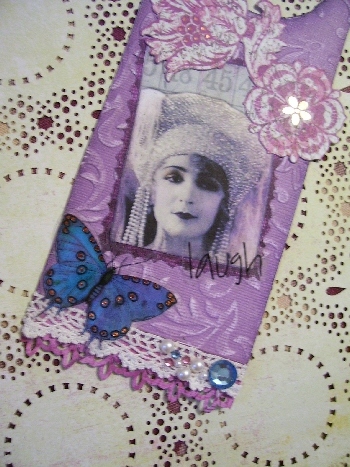 Then I proceeded to embellish with an image I found already printed off and fit the colours beautifully, I added some K and Company pre cut flower embelly at the top, I found some precut border and added it to the bottom then a layer of lace on top of that and added some beads, a transparent butterfly, a word sticker and I inked the edges with some Dusty Concord DI. That was it. Sounds like I just whipped it together that fast....well not really. My first idea didn't work so this was my second and I really like it. I can't wait to show you my next door tag, it will be sort of water or bathroom related. Oh the fun of it all. These would make great gifts for your kids, hostess gifts, a shower gift. There are so many possibilities really. A door tag for the craftroom, DO NOT DISTURB I am Musing. Thanks Jeanie for a great challenge. Wouldn't this make a great swap idea too? I have a couple template ideas to alter. Can't wait to show you when I get to them. 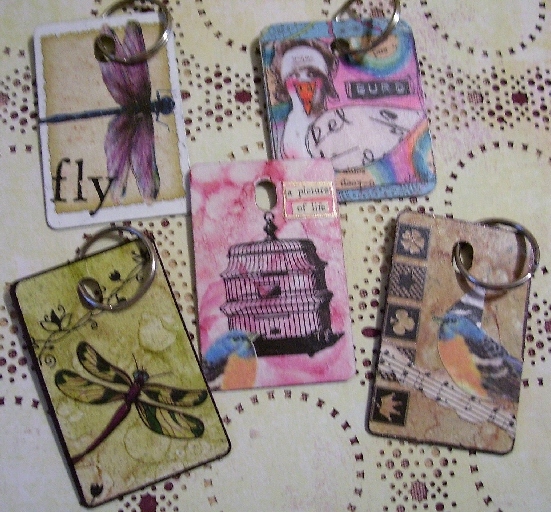 Next are some more key tags that I worked on earlier this week. I discoverd that rub ons work great on this surface as well. If you do any of these just remember to make sure you use a good sealer on them. Afterall they will get tossed around, dropped etc and to do all that artwork then to be ruined is very upsetting. 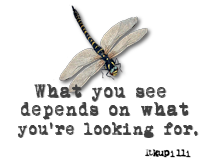 Take a look at the dragon flies and that birdcage....rub ons. Cool huh? I took a trip to Loew's this week, a few days earlier I was at Home Depot to get tags. Now I have plenty to make and have on hand. I recently sent a few to a blogger follower in England as she was unable to find any. I don't mind as I think in return I will be getting a key tag made by her. Can't wait. If you have made any tags, please let me know. Just drop a post or click on my email tag on the side and let me see what you have created. Afterall it's all about sharing isn't it? And finally, remember in my Giveaway I recently had, there was a homemade stamp included, the umbrella man, well I made a tiny stamp to do for my friend Lori on a domino. Lori and I have been exchanging altered dominoes coming up a year soon. We pick themes ,then every month we send each other a domino in that theme. It has resulted in some great artwork exchanged between us. This month we were to represent spring. I took a bit of a different take on it because spring means rain, rain means flowers and new growth. 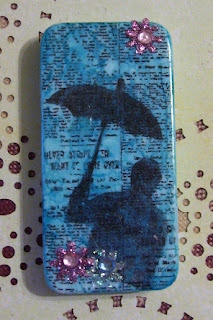 So here is my Umbrella Man, I alcohol inked the background, stamped with a newsprint small stamp on the background in StazOn, then I stamped Umbrella Man over top with Black StazOn again. Added some flowers for a bit of bling and there you have it. Well that is it. It is raining here today so I had fun creating, watching a couple movies, a bit of housework and now just taking it easy. Thanks for dropping by and I always love hearing from you. You have been SOOOOOOOOOOO creative, my friend! I adore your door tag! It's just gorgeous! (Be sure to link it on my page). Your key tags just get cuter and cuter. And that domino is divine! I just got a lot of domios, so I need to come up with some ideas! Love the Door tag.. just beautiful.. and the domino is so pretty.. love your umbrella man stamp.. still haven't gotten into wpg to get some of these things.. are these the ones for the countertops etc? off to check out Jeanie's challenge..
Well, I for one am glad you "fiddled and farted", all of this artwork is beautiful! I think the domino is my fav, no maybe the birdcage, no maybe...I could do this all night. Cool, cool, cool, love all of your tags and that door one is such a great idea!!! Oh and the dominoe is great too. What do you do with your traded dominoes, have you got a clever idea on how to display them??? 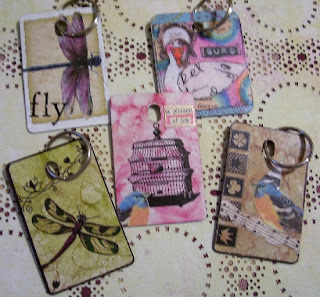 Wowsa, you have been busy Les...Your door tag and domino are fab and I'm loving those key tags! Love the door tag- the sanded coordinations is so pretty in purple- and love the embellishments. Love the tags- how cool are they and the domino. 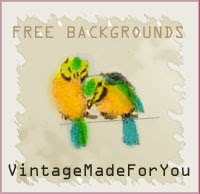 You have been creatively quite busy-lots of eye candy! Wow, you have been busy. I have finally finished my cousins 8"x8" childhood album. I have had the photos for close on 7 years and finally got stuck in and did it cos she is here on holiday and can take it home with her. I work best under pressure! I like your domino idea, never thought to alter one of those! I love your door hanger, very creative. I am off to plan my week, hope you have a good one. Beautiful work. I hope you will come by and see mine.